I asked, of course, if the lamb was grass-fed. It was, and was from Oregon. How could I say no? 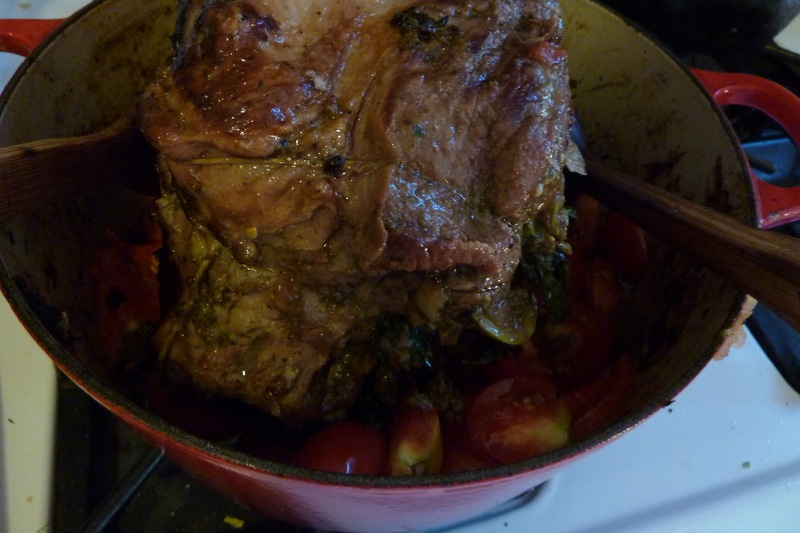 I love lamb, and this was local-ish and sustainably-raised. I imagined we were going to get a small cut or package of something like lamb stew meat or ground lamb. 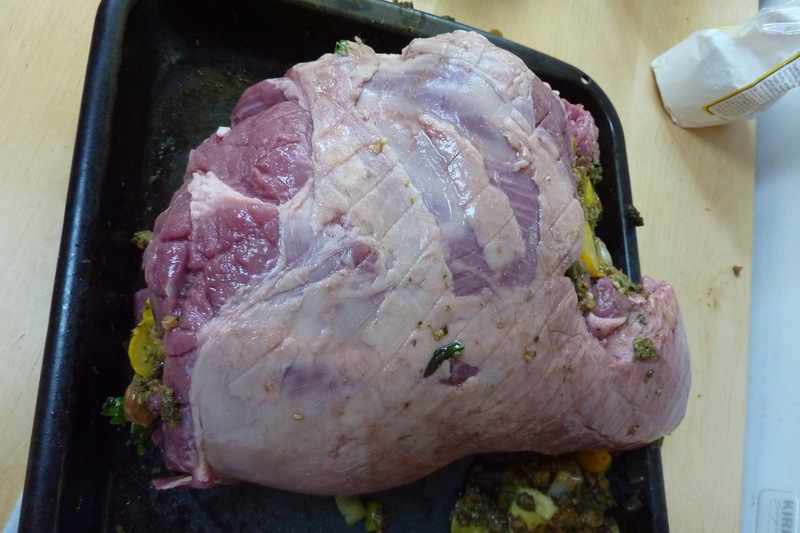 Instead, the mystery cut was… an enormous boneless leg of lamb. Many home cooks are daunted by cooking meat in the first place––even something simple like chicken pieces–– and are way too intimidated by something like a leg of lamb. But with good ingredients, a thermometer, and a sense of humor, you can totally tackle this. So what do you do with a giant leg of lamb? Step 1: Call over a bunch of your dearest friends for dinner. Check. 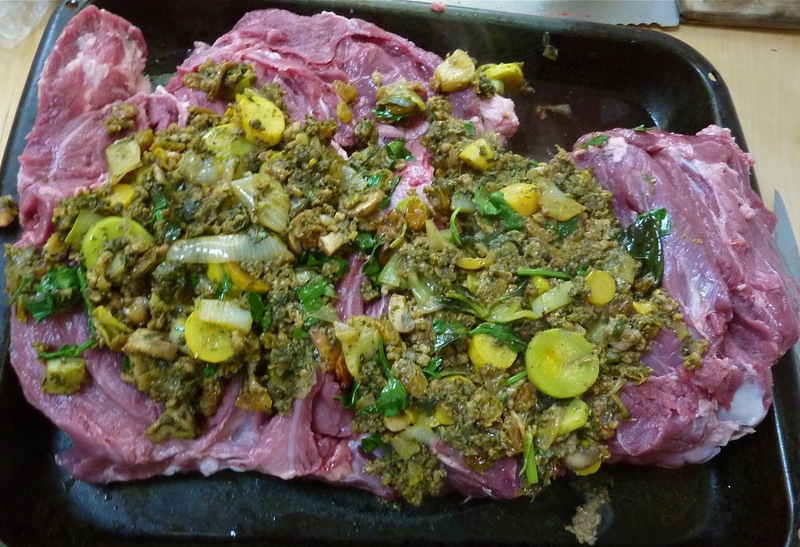 Step 2: With a leg of lamb, the next question is: to roast or to braise? 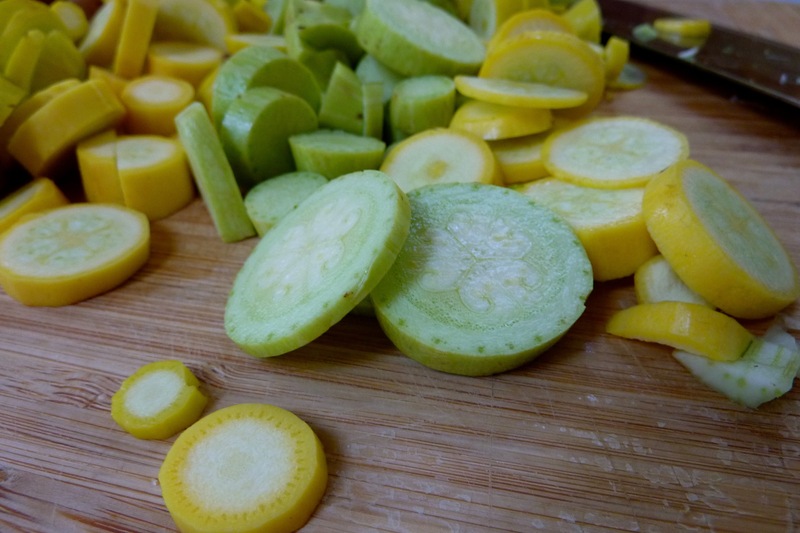 I find summer is better for roasting, winter is better for braising. In the winter, you want something soupy and falling off the bone, tender and full of beans and comforting enough to get you through a cold night. Slow braising is also best for meat with the bone in, when you can savor the marrow and let the bone leech nutrients into the meat. Since the leg was boneless, I knew I wanted to stuff it. I first had stuffed lamb at Kabab Café in Astoria, NY, and it was a revelation. Ali El Sayed, the warm-hearted and insightful chef at Kabab Café, is a culinary genius. I’d never thought of stuffing anything into lamb. 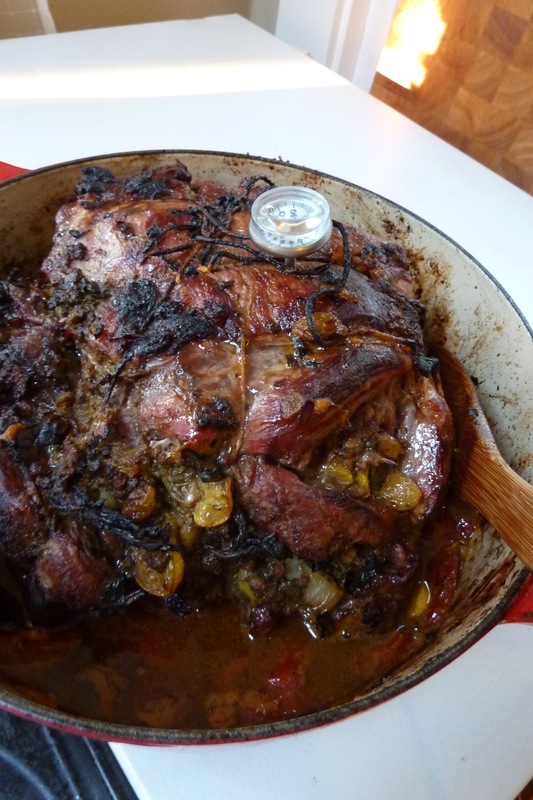 I grew up on lamb that was simply poked with garlic and rosemary and left to cook. But Ali stuffed lamb with combinations of things I still can’t identify, a dish I couldn’t stop thinking about after I first ate it. I decided to stuff my lamb with the best vegetables of summer, and mix those vegetables with flavors that would hold the stuffing together, both literally and gustatorily. I’d serve it with a mushroom risotto, a tomato sauce built on lamb drippings, and some simple sautéed kale, although you could substitute a salad or some fresh sliced fennel for the kale. We ended the meal with a rhubarb-yellow-plum compote flavored with nutmeg and honey, thanks to my friend Karyn. This is a special occasion dish. But summer in Seattle is short. Doesn’t the fact that it’s still here kind of make any night a special occasion? 2. Using some olive oil in the bottom of your Dutch oven, sauté onion and garlic until the onion is clear and a little brown. Add the fennel and stir five minutes more. Add mushrooms and stir until they brown. Stir in ground lamb until brown. Stir in chopped parsley and basil and turn off the heat. 3. In a food processor, combine the gluten-free toast, basil, fennel leaves, parsley, and dried mushrooms. Blend until completely combined. 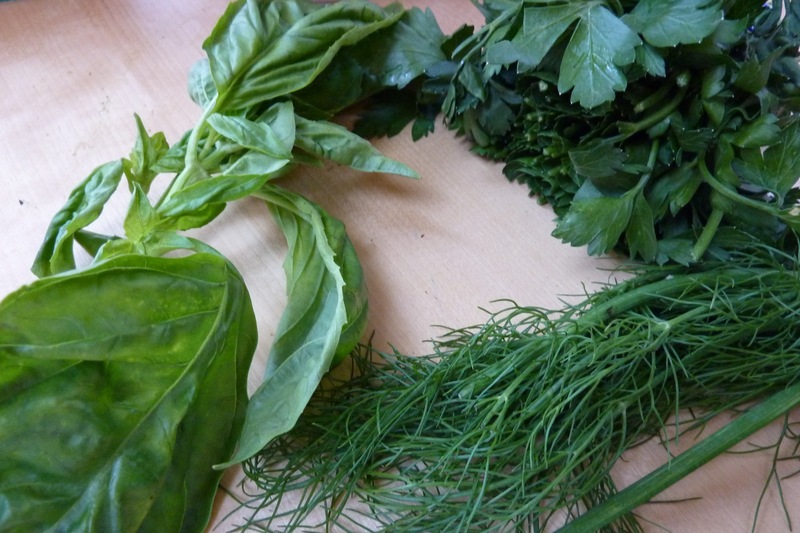 The herbs will turn this mixture dark green. 4. Stir this mixture into the Dutch oven, adding the saffron, cinnamon, and golden raisins, over low heat for two minutes. 5. Spread out the lamb on your spare roasting pan. Spread the stuffing mixture all over the lamb. Roll it up tightly and tie it with cooking twine. Push in the ends to keep stuffing from escaping. If you have leftover stuffing, roast it in a small baking dish at the side or freeze it for another cooking project. Since your Dutch oven is now empty, fill the bottom with the chopped onion, fennel, and carrots you’ve prepared. 6. Turn the oven off and turn it to broil on high. You’ve now prepared a hot oven with searing heat from the top. Place the lamb into the vegetables. Let it broil with one side up for seven minutes, then turn it and broil the other side for eight minutes, so 15 minutes total. 7. Turn the broiler off and put the oven up to 450 degrees. Roast the lamb at 450 for 30 minutes. 8. Take the lamb out and rotate it. Turn the heat down to 400. Add 1/2 lb of your tomatoes to the pot and stir into the vegetables already below the meat. Put the lamb back in the oven for 30 minutes. 9. Check the lamb’s temperature with a meat thermometer. It’s supposed to reach 135F for medium-rare; time it as you prefer your meat. 10. When it’s done, take the lamb out and let it rest before you think about slicing. Time to prepare the tomato sauce. 11. You already have the tomato sauce most of the way done. Chop the garlic you’ve reserved for the sauce, and add it to the cooked drippings/tomatoes/vegetables. 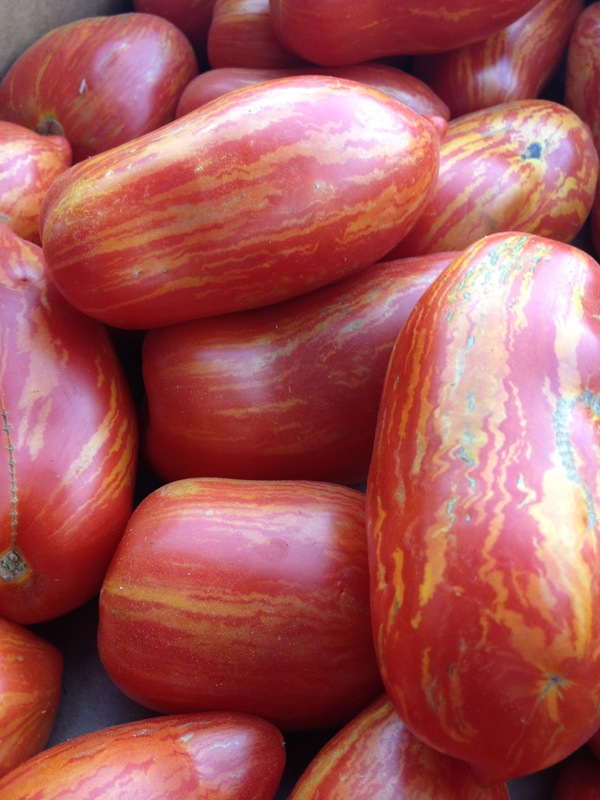 Also chop the remaining tomatoes and add them (I used the gorgeous ones below plus some small, ripe red ones, both from Tonnemaker’s at the farmers market). Add saffron, crushing it between your fingers. Let the mixture simmer while you work on the risotto. When you’re ready to turn the sauce off, use an immersion blender or regular blender to purée it, then turn off the heat, tear in a handful of basil, and add a few dashes of olive oil to complete it. 12. 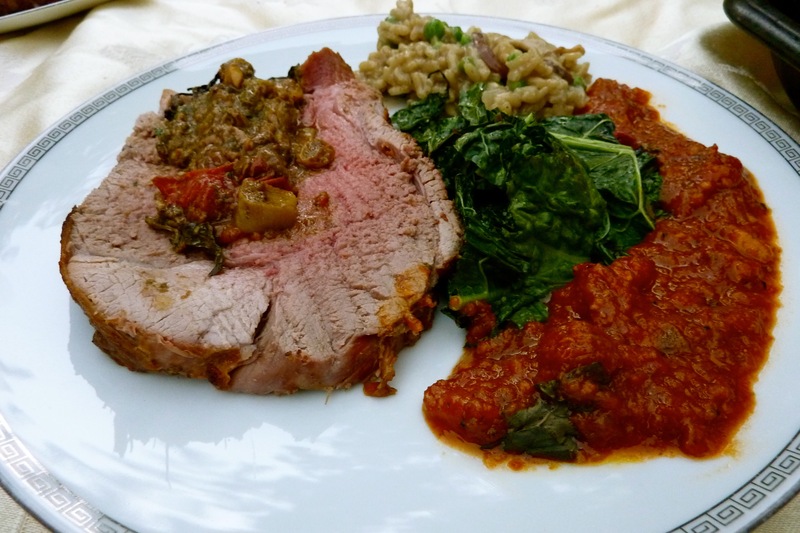 If you’re serving the lamb with risotto, chop your onions, garlic, and mushrooms, and set aside. Warm broth and set over a low flame. You can crumble your saffron directly into it. 13. Sauté onions and most (but NOT all!) of the garlic in butter until onion is clear. Salt slightly. 13. Stir the rice into the pot and let it get coated by the onions and garlic. Add the white wine and stir. 14. To cook the risotto fully, add the broth one ladle at a time, until the rice is cooked but still slightly al-dente. Turn off the heat. 15. Slice your mushrooms. 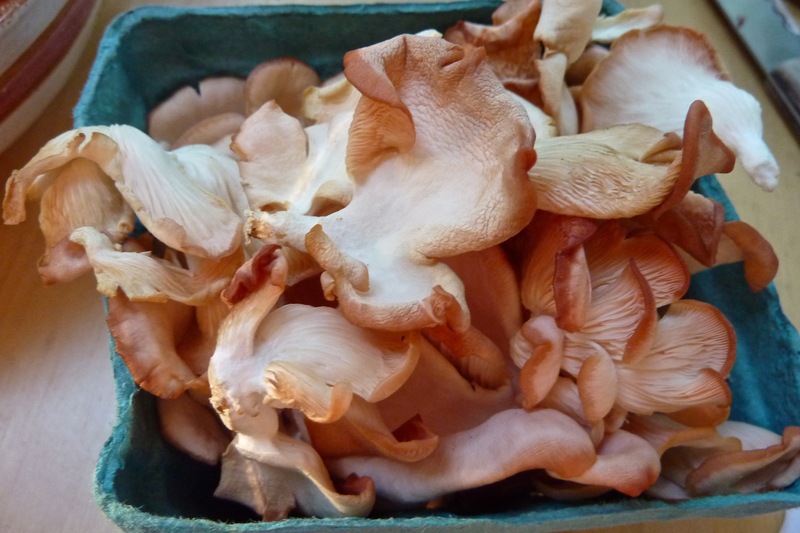 I used a mixture of different varieties, including some gorgeous pink oyster mushrooms. 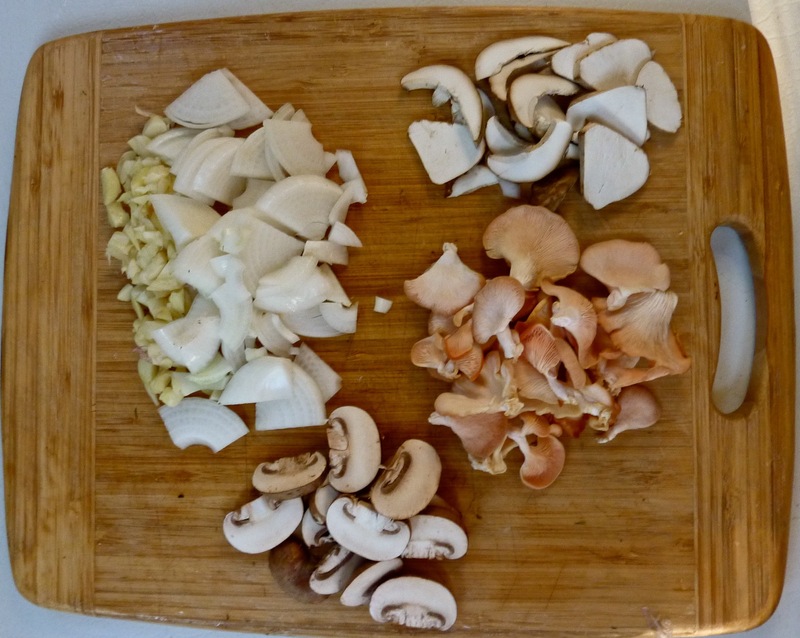 In a large pan, sauté the remaining garlic and all the mushrooms in butter until the mushrooms brown and release their juices. 16. 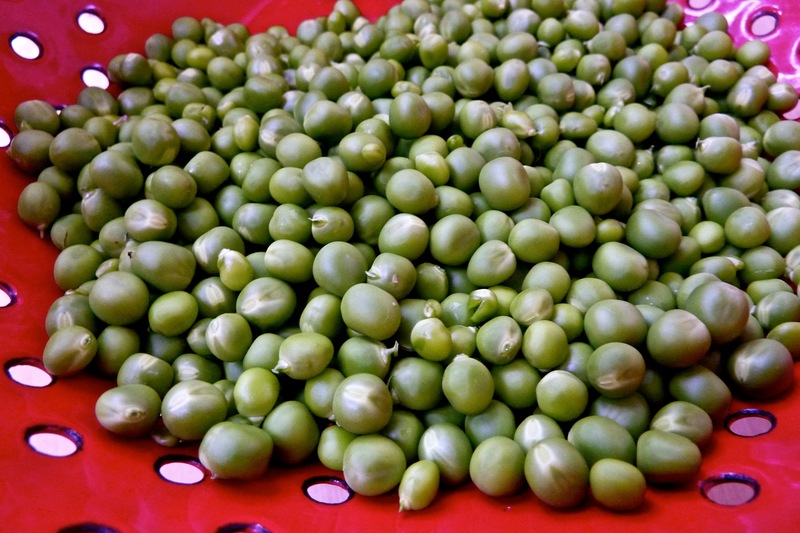 Stir this into the risotto with the uncooked English peas, the parmesan, and the butter. The heat of the risotto will cook the peas to perfection, especially if you’re using tiny peas like the ones I got from Willie Green’s at the Columbia City farmers market. 16. Slice the meat. Ali’s advice is to give everyone tastes of different sections of the leg, because they are different in flavor. Serve with any bright-tasting green side, like a salad, sautéed kale, or fresh fennel slices. 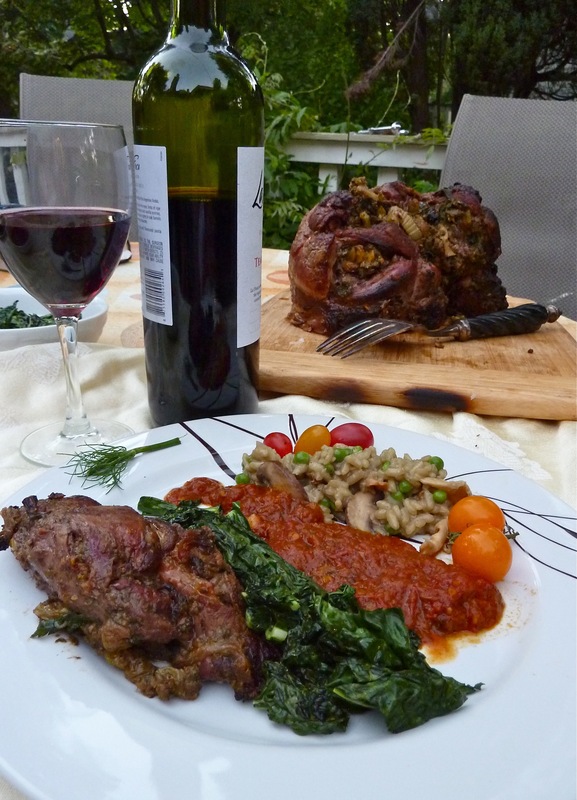 If you like this recipe and like local food, please vote for it! Nearly everything in this lovely dinner came from local sources, with the exception of the spices, olive oil, golden raisins, and rice. 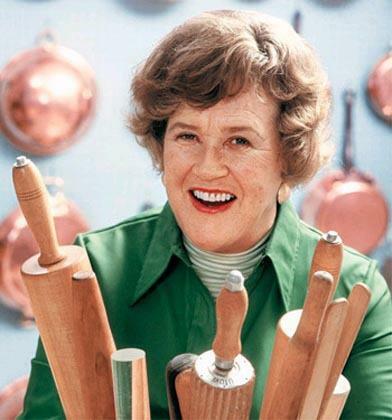 As today’s Google Doodle probably already suggested to you, this would have been Julia Child’s 100th birthday. Seems appropriate to raise a glass of wine (or two; this IS Julia…). I grew up watching old episodes of The French Chef. My mother taped them all off PBS. We had Mastering the Art of French Cooking (volumes 1 and 2) on my parents’ shelf in New York, and another copy in our family friends’ basement in Seattle, just to make sure we wouldn’t be without Julia when we were subletting houses and cat-sitting in Seattle in the summers. My mother was really the source of this Juliaphilia. She lived in Paris for several years after she finished college and fell in love with French cooking, adopting French methods and bringing a French sensibility to traditional Jewish recipes like brisket. We shopped at farmers markets, cooked at home with good ingredients, and delighted in simple food. “It’s best when it’s fresh,” my mother still says, usually to justify herself or a family member reaching for another serving of something delicious. In college, I was part of a 110-person vegetarian co-op. Once a semester, we were each responsible for collaborating on a special meal, either a fancy Saturday night dinner or a Sunday brunch. My friends and I decided to make French breakfast, a pile of baguettes and croissants and butter and jam and tea and coffee and juices. (This was before I figured out I couldn’t eat gluten.) I called my mother. She faxed me everything Julia wrote about croissants and baguettes. We stayed up all night in the kitchen, spraying the ovens with water every time Julia’s faxed pages said to do it and studying diagrams of proto-croissants. Being Jewish, I didn’t feel left out when Christians started wearing W.W.J.D. bracelets and using hip language about their faith, like, “I’m down with JC!” (I really did hear someone say that once.) After all, my family had our own ideology: What Would Julia Do? And, of course, we were also down with JC. The very tall JC who wasn’t afraid of butter or fresh ingredients or being utterly delighted by food without having to find cutesy or obnoxious ways to word her utter delight. To Julia, to butter, to fresh ingredients, and to many more years of inspiring cooking with fresh ingredients and utter delight. And to making sure access to ingredients and cooking skills and time and health are recognized as a right, not a privilege.